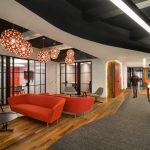 Evolution Design creates an innovative space for VodafoneZiggo’s call center in Rotterdam, which inspires collaboration and a sense of belonging among employees. 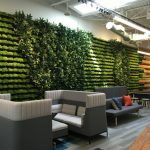 Throwing away the notion that a call center should feature flanks of uniform, impersonal desks, Evolution Design creates a series of different environments, so that staff can choose the atmosphere in which they prefer to work. The offices feature a bright and colorful design in the reception area. Image courtesy of Evolution Design and Peter Wurmli. Instead of creating a flank of impersonal desks, Evolution Design created a series of different environments for employees to choose to work from. Image courtesy of Evolution Design and Peter Wurmli. There are open-plan work areas, open informal meeting areas, enclosed training rooms and enclosed meeting rooms. Other spaces include enclosed training rooms, a reception area, an open-plan café, a games lounge and a relax lounge. It’s downtown, within a five minutes walk to the Rotterdam central railway station. The top management was closely involved in the research and analysis process of the project planning, and supported the project also during later stages of design implementation. The various work spaces are designed to foster teamwork and a sense of belonging. Image courtesy of Evolution Design and Peter Wurmli. Interactive workshops with employees and management, research and data analysis were conducted prior the planning stage in order to gather a full scope of staff requirements, wishes and needs and analyse them against the possibilities and constraints of the existing location. In a call center, every person does the same job and needs the same equipment so the tendency is to have a battery of desks in a line. We decided to take a different approach and create a series of different environments within the space, so that staff can choose the atmosphere in which they prefer to work. The design also features multiple types of meeting spaces, such as this informal one. Image courtesy of Evolution Design and Peter Wurmli. Call centers are very regimented environments, where everything from break times to call times is controlled, and the workforce tends to be young and ethnically diverse. We wanted to create a space that gave staff more choice about how and where they work and also to help foster a greater sense of teamwork and belonging. The call center is spread over several large open-plan areas which Evolution Design converted into series of smaller workspaces, using low cost solutions, such as simple wooden frames, acoustic paneling or a change of flooring to demarcate different zones. Acoustic pannels, mobile divining walls, task chairs, height adjustable tables, storage units, armchairs, sofas, custom-made reception furniture, high-back chairs and lighting. When employees get breaks, they have a number of ways to relax and unwind. Image courtesy of Evolution Design and Peter Wurmli. The new workplace was designed in line with the brand color scheme and additional custom-made graphics ensure an individual look. Custom-made (green) houses, second-hand EUR-pallettes, which create an individual look, yet ensure different work environments within larger open space and demarcate the open space into individual different zones. The new offices reflect the company’s brand and culture. Image courtesy of Evolution Design and Peter Wurmli. Urban Lime replaced its stark offices with a rich, luxurious atmosphere.